It wouldn’t surprise me if most readers didn’t equate a quest to find one’s birth parents with a romantic journey, but they’d be wrong. Ms. Watson uniquely tackles the subject of adoption while delivering a quirky, romantic trip to an Island in the Mediterranean. In Finding You, our heroine, Jane Smith, wakes on her 25th birthday to an unsettling feeling she can’t place. But she follows that emotion out the door and straight to a travel agent’s office where she books a ticket to Santorini, Greece. Jane is going to find her birth father. In its essence, this isn’t so much a destination novel as what the destination does for the main character, Jane Smith. Yes, that’s her name, I’m not making it up, the author already did. Jane has spent a lifetime pushing away her adoptive family who she feels is better, prettier, and livelier than she is. 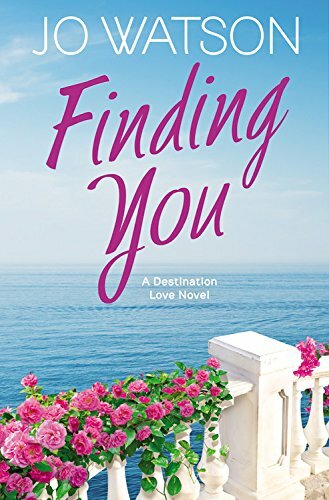 Through her search to find her father she stumbles into a romance, and equally important, she discovers who she really is. The author loosely works within the ‘ugly-duckling’ trope. The heroine’s ditzy, apologetic, I’m-not-beautiful mantra became tiresome until I realized the author had a plan. The self-deprecation was finally dropped and our heroine transforms into woman who is self-aware and confident. As for the hero, well, I have a litmus test he must pass. Above all things, he needs to be a man who can say the right thing when everything around him is going to hell. Particularly when he’s attempting to win back the heroine in the middle of the third act after he’s done some unspeakably stupid thing. So, I judge. Don’t we all? In this novel, Dimitri, the hero, gets high marks from this reader on how to win back the woman he loves. The journey Jane Smith travels isn’t a simple one. There’s heartbreak, but there’s also a great deal of growing, and this is one heroine that needed a serious adjustment. But that’s what keeps us romance readers going, how our heroes and heroines change and grow and love. This novel takes place in the romantic country of Greece. So for a few minutes I’ll ask you to forget the fact that you may have a family and twelve children, or a job you can’t leave. Instead, just let your mind wander and imagine a fortune teller has told you your one true love is out there waiting for you. Where in the world would you want to find him? Interesting review. Where in the world would I want to find my true love? I'm going to say Scotland or Ireland. Pamela - those are two countries I've never been to - but have always wanted to see. In my mind they are wonderful places for romance. Thanks, Pamela. I'm with Maria in wanting to see both those countries.